SAN FRANCISCO, Oct. 12, 2017 /PRNewswire/ -- Nintex today at BoxWorks 2017 is pleased to unveil Nintex Workflow for BoxTM, a new app that allows Box customers to easily automate processes from within their familiar Box environments. 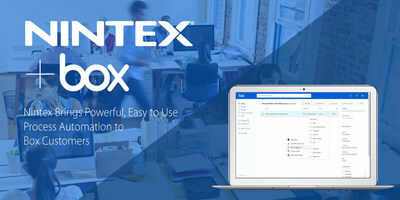 Available now at www.nintex.com/box, Nintex Workflow for Box connects to the award-winning Nintex Workflow Cloud, which offers packs of workflows on a subscription basis. Nintex representatives will also give live demonstrations of the new offering today from 11 a.m. to 3 p.m. in the BoxWorks Partner Pavilion at booth #3. Tens of thousands of organizations worldwide have standardized on Box's secure cloud content management platform to share, access and collaborate on files every day. Now they may also take full advantage of Nintex's award-winning workflow cloud platform. Since announcing the integration earlier this year, Nintex has been providing seamless connectivity with Box's best in breed cloud content management solutions to support growing customer demand for workflow and content automation across departments like HR, sales, finance, operations and IT. "Box's strategic partnership with Nintex is further proof that the company is serious about empowering its customers by giving them the ability to deliver content in motion," says Aragon CEO Jim Lundy. "With Nintex's industry leading workflow and content automation solutions, Box customers can access their stored content and now quickly kick off the automation of sophisticated content-rich workflows without ever leaving their Box environments. This expands Box's solution portfolio and it should help enterprise organizations around the world accelerate business outcomes." "We've specifically designed Nintex technology to be easy enough for line of business departments to use while ensuring it is trusted by IT," says Nintex SVP of Technology Strategy Ryan Duguid. "With the introduction of Nintex Workflow for Box, we're enabling every Box customer to extend the powerful collaboration and security of Box with advanced workflows. Nintex Workflow for Box lets customers leverage our award-winning workflow cloud technology to streamline content creation and collaboration from anywhere with less manual work, while ensuring consistency, repeatability and auditability across business processes." "The need to automate content-centric processes to drive faster business results for customers is more critical than ever before," says Box Chief Product Officer Jeetu Patel. "Box's cloud content management platform combined with Nintex's workflow automation capabilities opens up new possibilities for enterprises to streamline businesses processes while ensuring their content stays secure and compliant." Workflow – simply drag-and-drop to visually create sophisticated processes that act on the content stored in Box and capitalize on its metadata to dynamically drive business outcomes. Document Generation – easily incorporate data-driven document generation by bringing together form data and line of business data with content and metadata from different sources (like Box, Salesforce and more) to securely share files and collaborate as part of a workflow; automatically stores resulting files back in Box. Forms – quickly design dynamic, modern web and mobile forms that makes it easy to go from data capture to action, like updating metadata on content stored in Box or driving business decisions. Mobile – quickly build powerful process mobile apps to support content creation, distribution and management. Process Intelligence – immediately gain actionable insight into the effectiveness and business impact of automated content-centric workflows to analyze and optimize organizational content and collaboration processes. From new employee onboarding, to contract lifecycle management, to empowering customer service, Nintex Workflow for Box empowers businesses to move beyond simple automation and achieve process optimization natively in Box with clicks, not code.